It is important that 97% of the world’s population understand that recent global warming is catastrophic and unprecedented, thus caused by them. In order to achieve this, a select group of the world’s elite climate scientists and institutions have scandalously revised the world’s temperature records to fit the pattern of a cooler past and a warmer present, consistent with the ‘Hockey-Stick’ illusion. 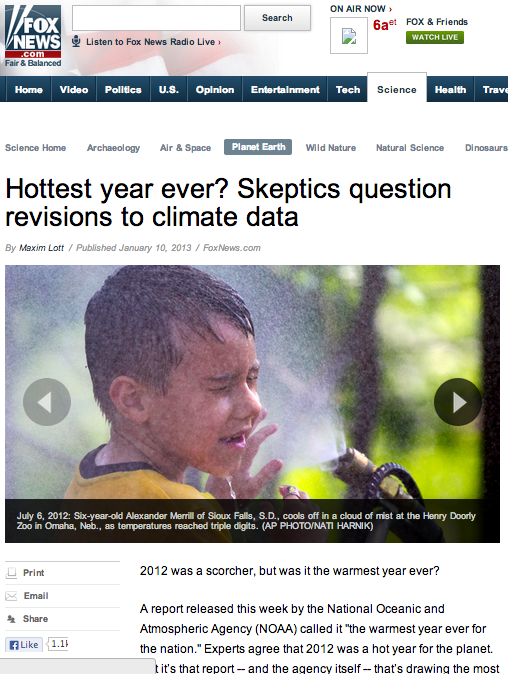 Indeed, in the U.S. the warmest decade was the 1930s and the warmest year was 1934. In 1989, NOAA and the UK’s leading expert, Dr Phil Jones, agreed with Hansen that US had not warmed. Last week, scientists from the United States Commerce Department’s National Oceanic and Atmospheric Administration said that a study of temperature readings for the contiguous 48 states over the last century showed there had been no significant change in average temperature over that period. Dr. (Phil) Jones said in a telephone interview today that his own results for the 48 states agreed with those findings. 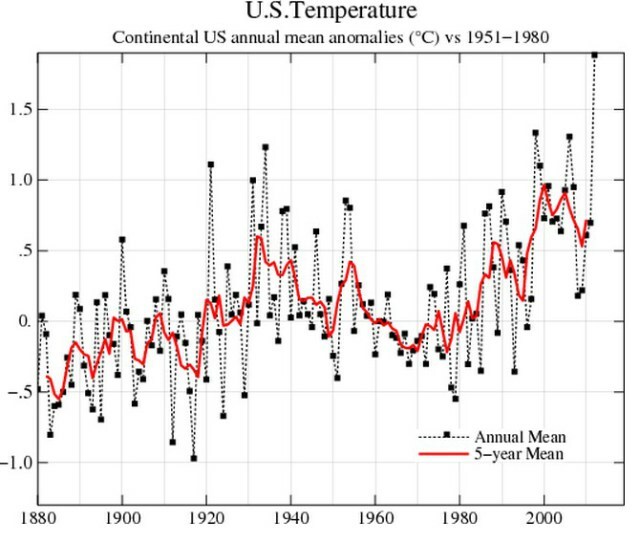 But in the year 2000, NASA and NOAA altered the historical US temperature record, which now shows that there was about one degree centigrade US warming during the century before 1989. 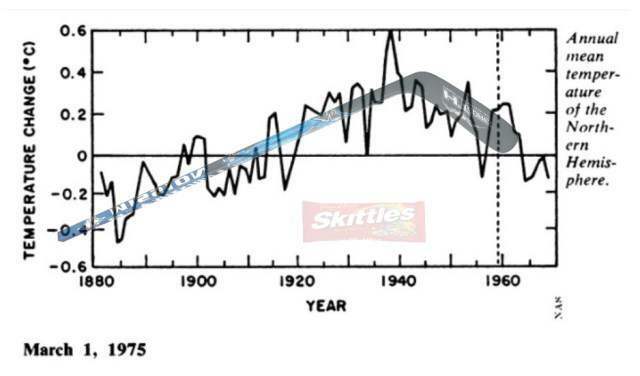 But that just wasn’t to do, so NASA created a hockey stick of data tampering. 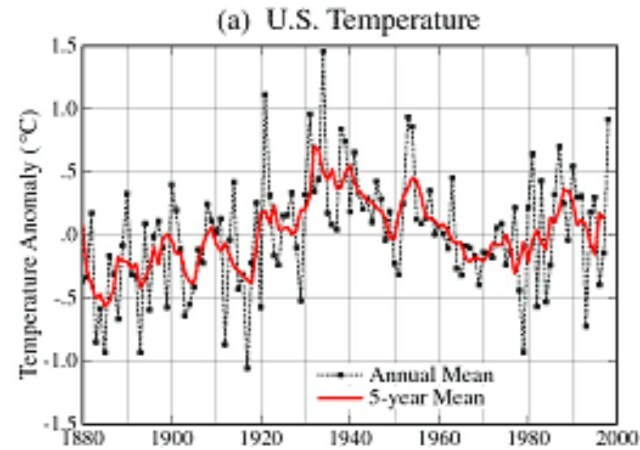 NOAA and NASA do spectacular amounts of tampering to the US temperature data set, which actually reverses the measured trend. This comes at a very high price. Science itself is wrecked. People attempting to interpret the data are trying to draw conclusions based on garbage data. Thus their conclusions are also garbage. Amazing how a small handful of unscrupulous people can wreak so much havoc. Empirical evidence does not lend much support to the notion that climate is headed precipitately toward more extreme heat and drought. The drought of 1999 covered a smaller area than the 1988 drought, when the Mississippi almost dried up. And 1988 was a temporary inconvenience as compared with repeated droughts during the 1930s “Dust Bowl” that caused an exodus from the prairies, as chronicled in Steinbeck’s Grapes of Wrath….. 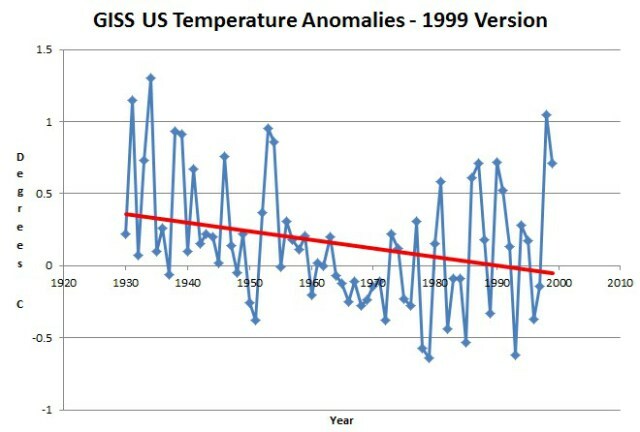 The next graph shows the 1920-1999 changes which Hansen made to the US temperature record since 1999 – in GISS version 3. The next blink comparator shows the changes that were made to the US temperature data since 1999. The year 1998 was promoted from #4 to #1. 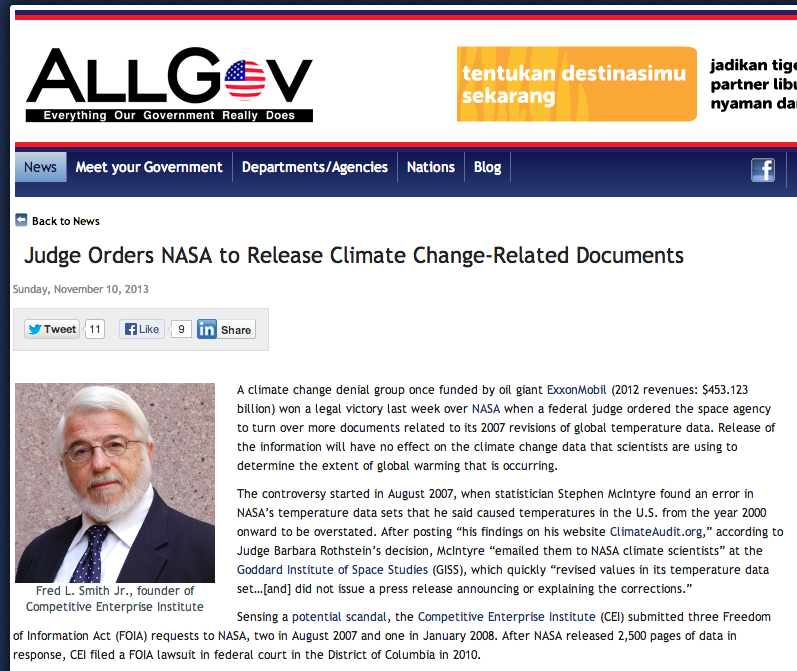 Hockey sticks are indeed man-made – by climate activists pretending to be scientific heads of government agencies. 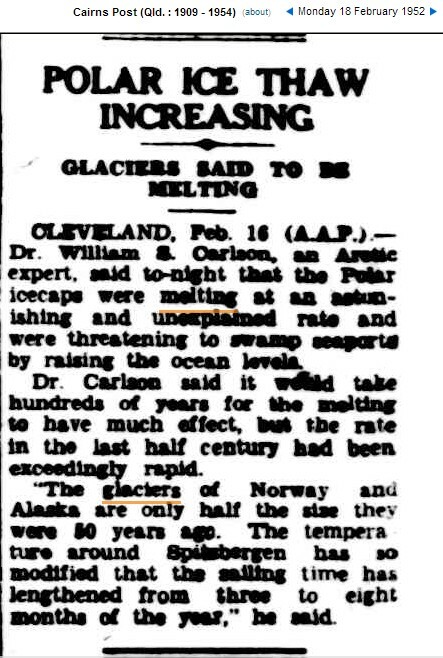 This version is from the National Academy of Sciences, before self-awarded Nobel Prize Mikey straightened them out that the world was heating out of control, rather than cooling out of control. In 1975, people were too stupid to know the difference between cold and heat. 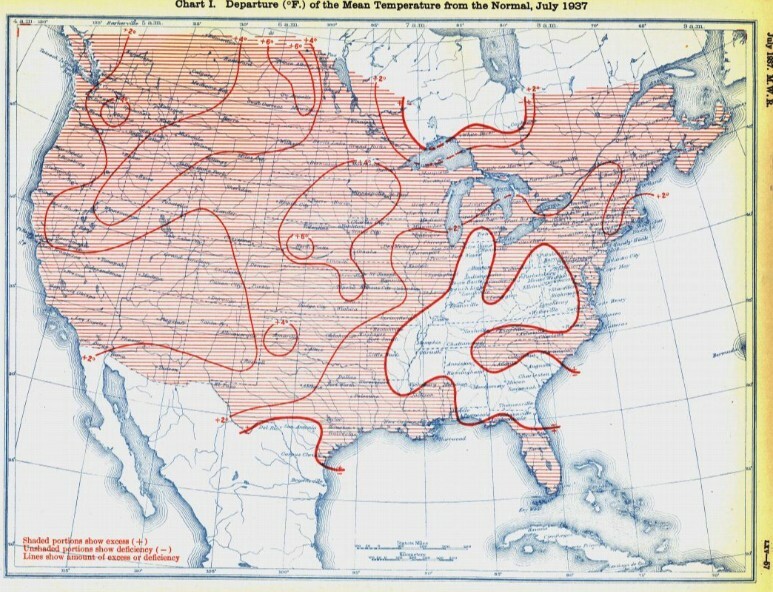 They show that perhaps 50 % of the US was hot in 1936. Sadly for the climate liars at the EPA, the US Weather Bureau actually kept records of these things at the time. 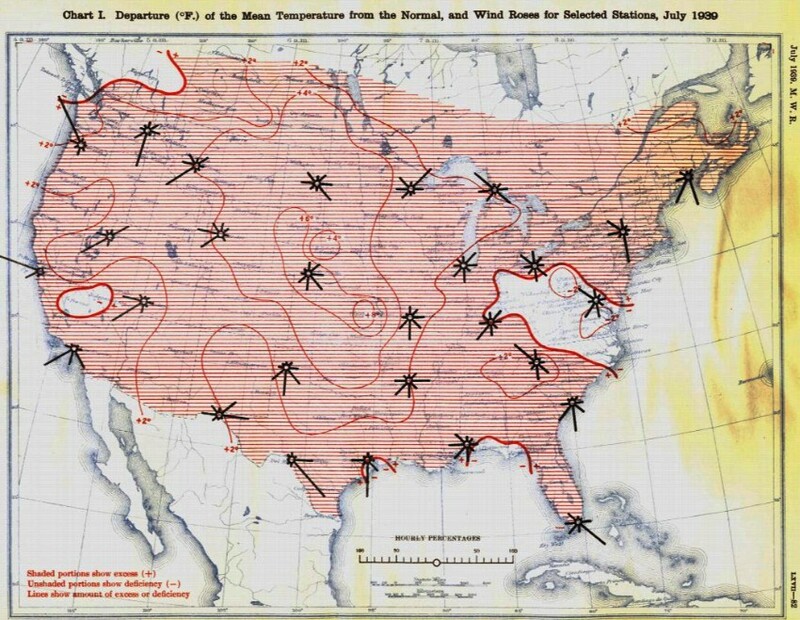 Almost the entire US was overheated during the summer of 1936. But it gets worse. The EPA shows that just over 10% of the US was hot in the summer of 1937, when in fact it was closer to 90%. From the 1990 IPCC report. 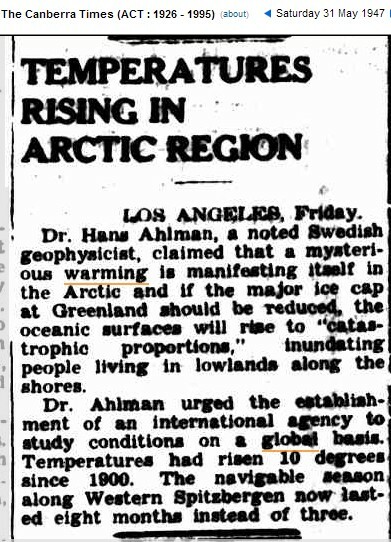 Remarkably, no one prior to Michael Mann had noticed that the world was heating out of control since 1860. 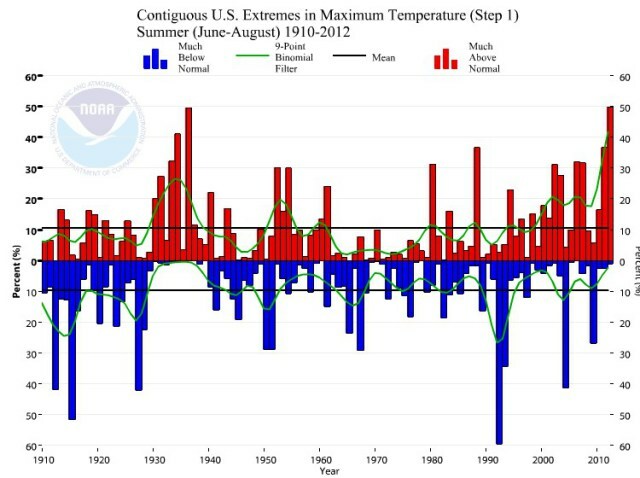 The NOAA US Climate Extremes Index shows that 2012 maximum summer temperatures were tied for the highest on record. This is utter nonsense. 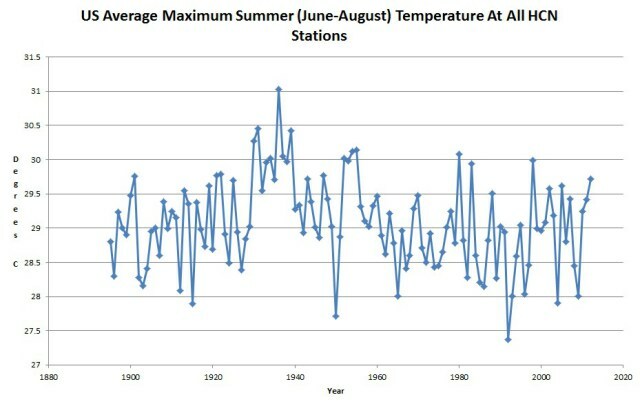 According to GHCN US data, the summer of 2012 had the 21st hottest maximum temperatures, was more than 1C cooler than 1936, and was cooler than most of the years in the 1930s. The next graph overlays the HCN data on the CEI data. 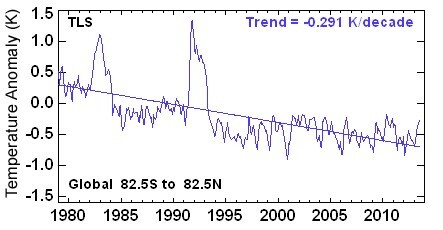 The match isn’t too bad until about the year 2000, when NOAA started fabricating data to pump the numbers up. 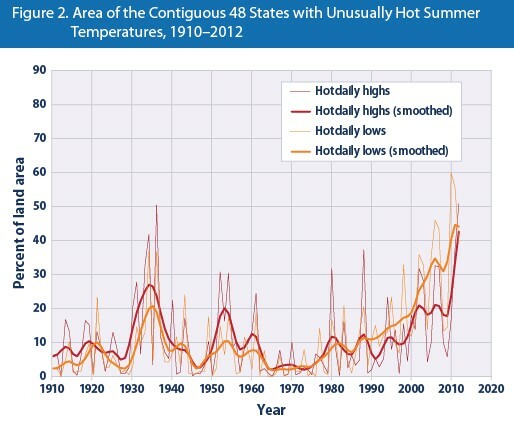 NOAA shows the summer of 2006 as being 7th hottest on record, when in fact it was the 82nd hottest. 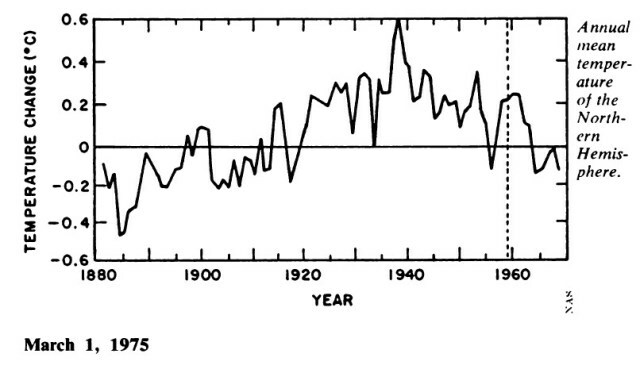 The EPA says that summers in the 1930s were much hotter than any summers prior to 2009. Why does NOAA think they can get away with lying about this? The animation below shows how they altered the temperature data to wipe out the inconvenient 1930s, and massively warm the 1990s. 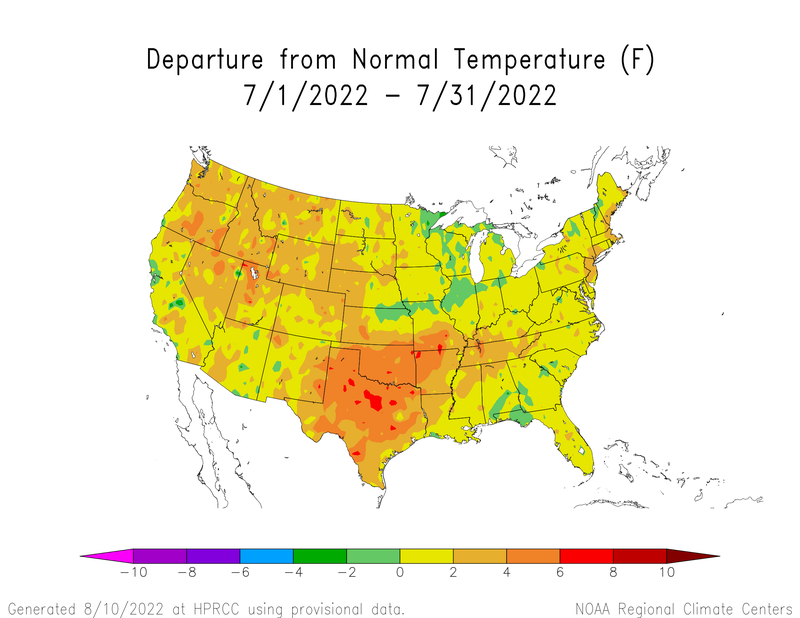 The next animation uses NASA’s published data from 1999 and 2013, and shows how they turned a strong US cooling trend into a strong warming trend. 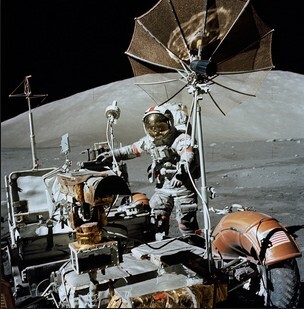 NASA is constantly cooling the past and warming the present – in order to make it appear that Hansen’s theories aren’t the miserable failure which they actually are. According to NASA, people in Iceland used to read their thermometers 2.5C too high, and now they read them too low. And it is surely just a coincidence that the years NASA cooled 2.5 degrees also happened to be the ones which wrecked their global warming scam. 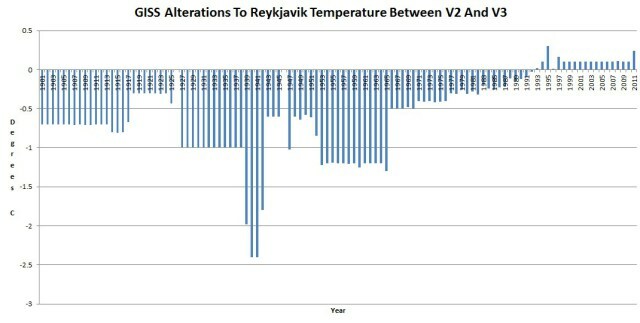 The problem is of course that Icelanders are dumb, not that NASA has been engaging in massive scientific fraud. 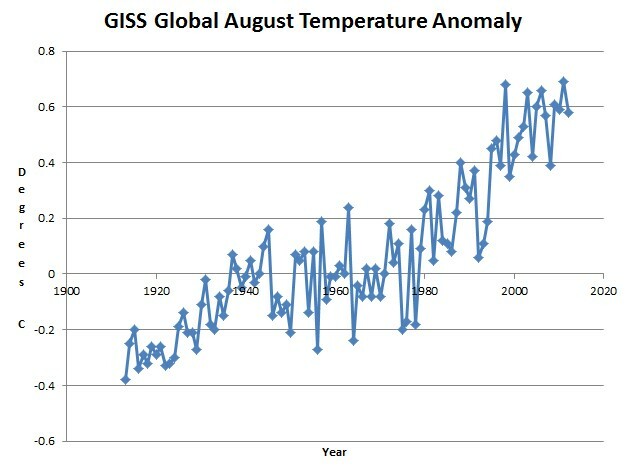 GISS shows that August temperatures have been increasing, and that August 1913 was the coldest in the last 100 years. 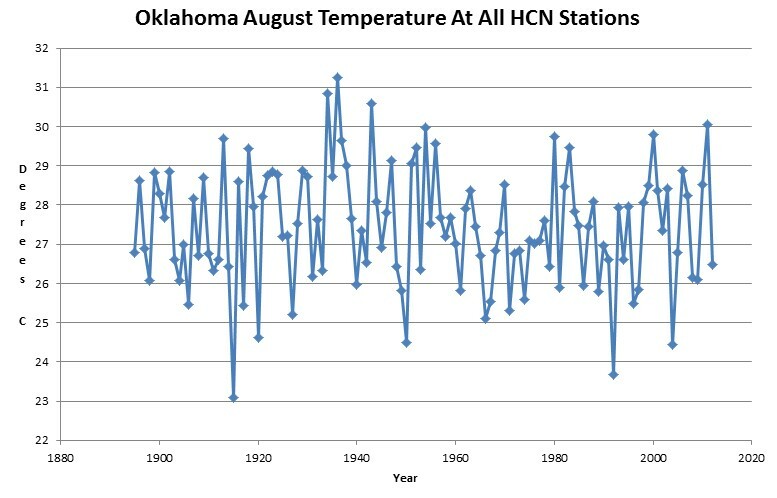 Raw GHCN temperatures for Oklahoma show that there has been no trend in August temperatures, and that 1913 was one of the hottest on record – with 1934 and 1936 being by far the hottest. Conclusion : Either Oklahoma is not part of the planet, or GISS temperatures are a complete fraud. 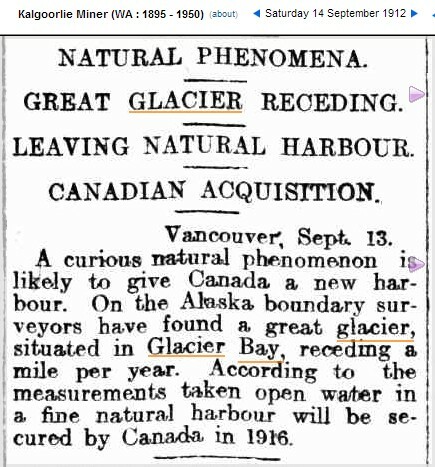 The summer of 1913 holds the record for the hottest temperature ever recorded on Earth, and GISS tells us that summer was very cold. One E-mail from the White House can end global warming. All he needs to do is to tell NOAA and NASA to stop jacking the temperatures up. Presto! 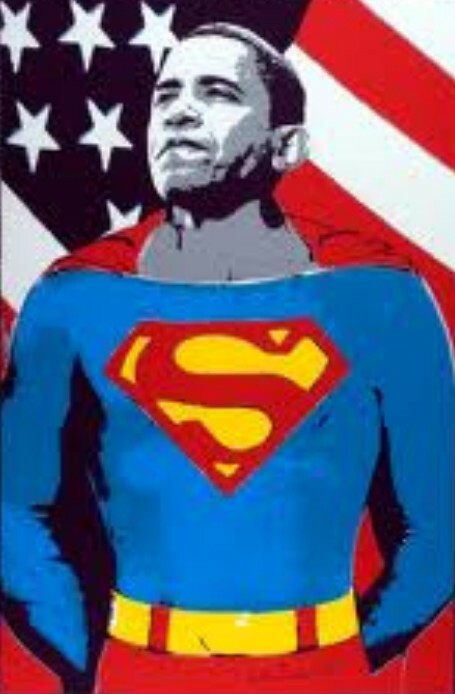 Obama will have stopped global warming – and saved the planet. They reported that sea level is rising at 1-2 mm/year, which means that Miami won’t actually drown for another 3,000 years or so. 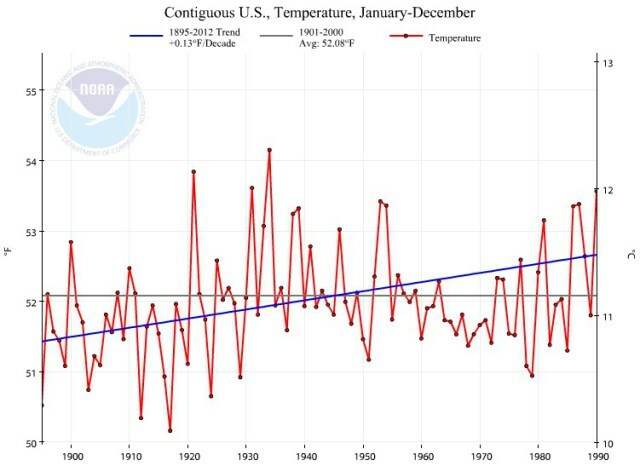 One theory which alarmists used to talk about (before they went full criminal) was that global warming causes stratospheric cooling, and they used the trend below. According to Hansen, this massive glacial retreat occurred during the coldest years on record. 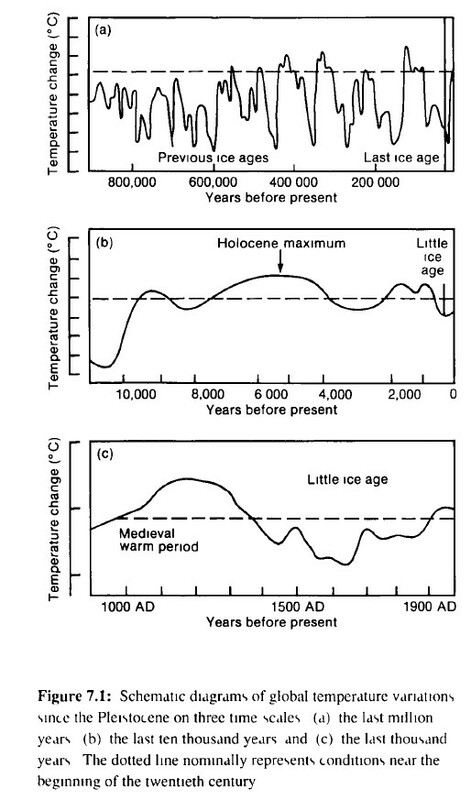 Hansen also tells us that glacial melt is due to global warming, and is going to drown Manhattan by the year 2008. 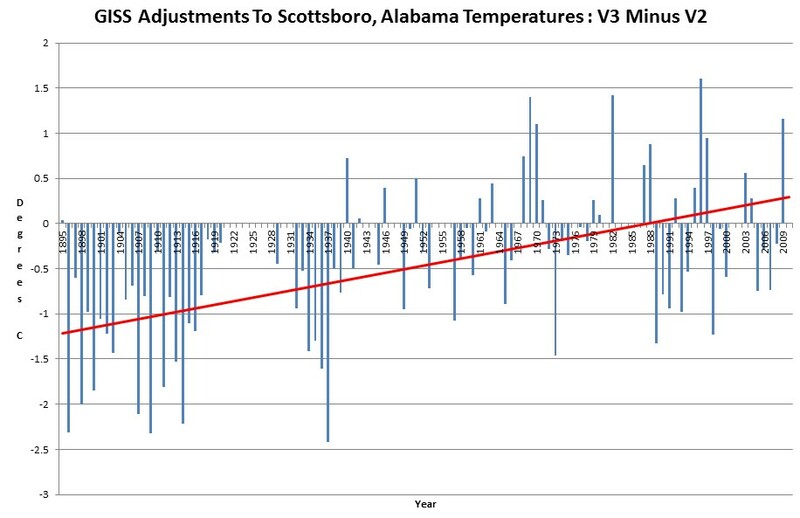 Alabama cooled dramatically from 1920 to 1970. 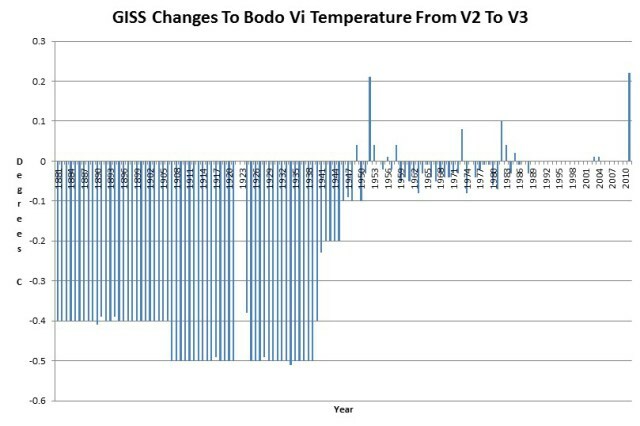 NASA got rid of this inconvenient decline, by cooling the past and warming the present a total of 1.5C. 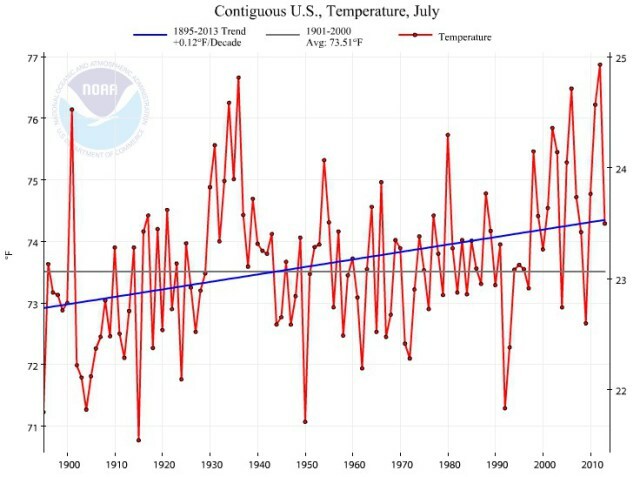 NCDC reports that July was the 30th warmest on record in the US, and that July temperatures have increased by about 1F since 1895. 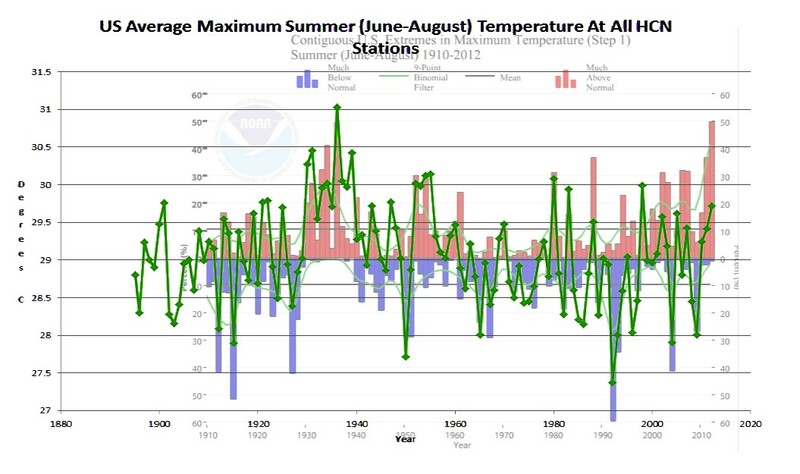 The thermometer data they used (prior to data tampering) showed that July was the 71st warmest, and that there has been no change in July temperatures since 1895. 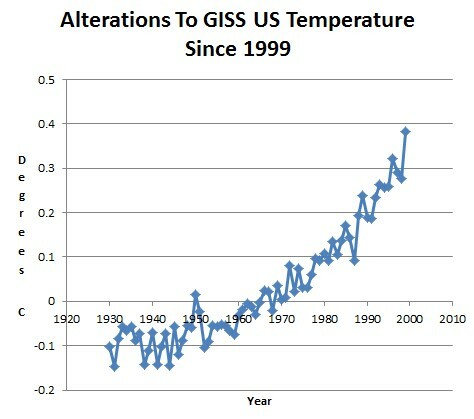 The animation below shows how they have created a completely fake warming trend by good old fashioned data tampering. The next graph shows how they have systematically cooled the past and warmed the present – to create a non-existent warming trend. 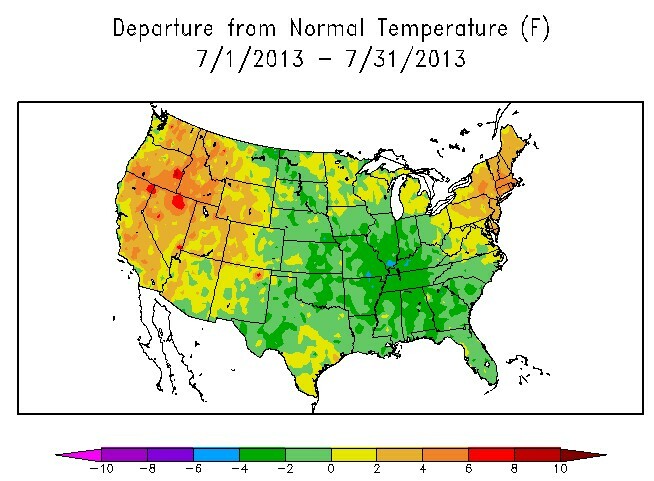 Most of the country was below normal last month, yet NCDC gave July a top 25% ranking for warmth. 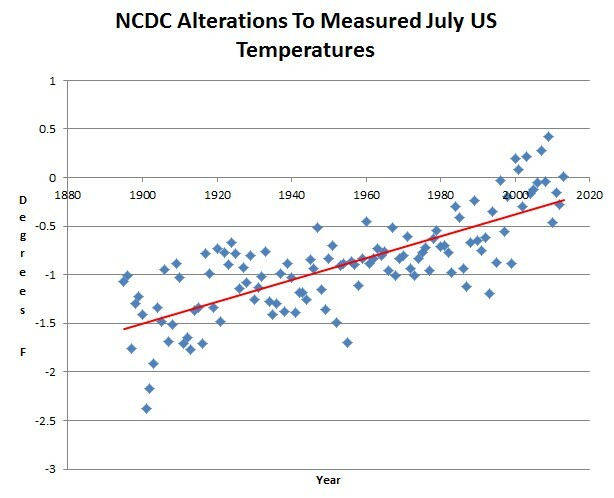 Now compare vs. July 1939 – which NCDC says was about the same as July 2013. 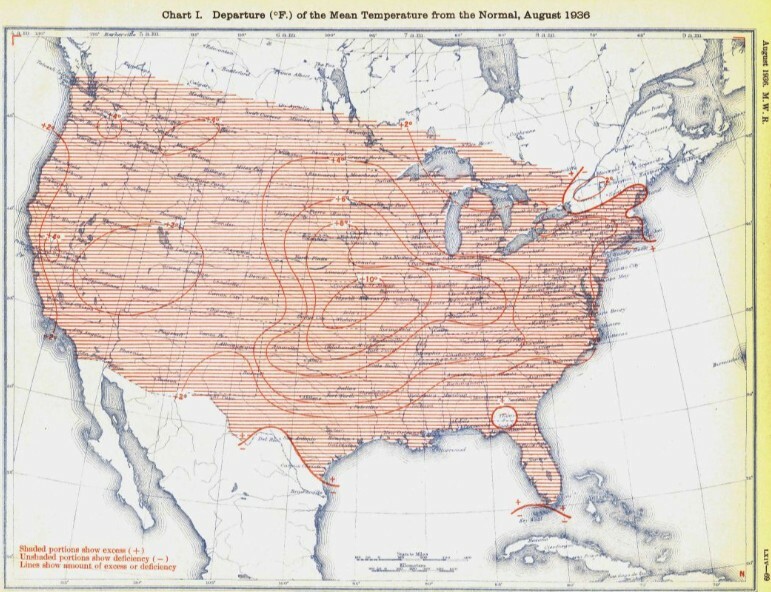 Almost the entire country was hot in July, 1939. Many people died in the July 1939 heatwave, which NCDC says was about the same temperature as the very cool month of July 2013. 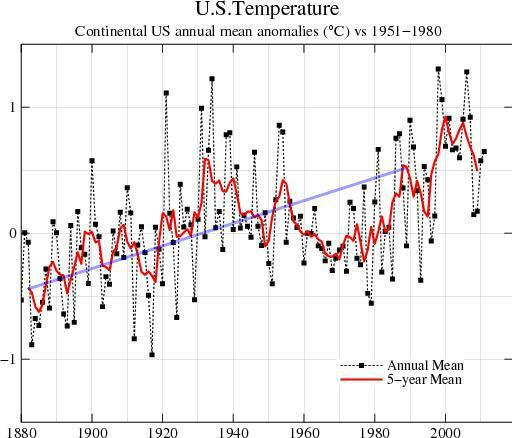 The bottom line is that US temperatures as reported by NCDC and NOAA are complete garbage. They are generated for political purposes and have nothing to do with science. In 1989, NOAA and CRU said that there had been no warming in the US over the past century. Last week, scientists from the United States Commerce Department’s National Oceanic and Atmospheric Administration said that a study of temperature readings for the contiguous 48 states over the last century showed there had been no significant change in average temperature over that period. Dr. (Phil) Jones said in a telephone interview today that his own results for the 48 states agreed with those findings. 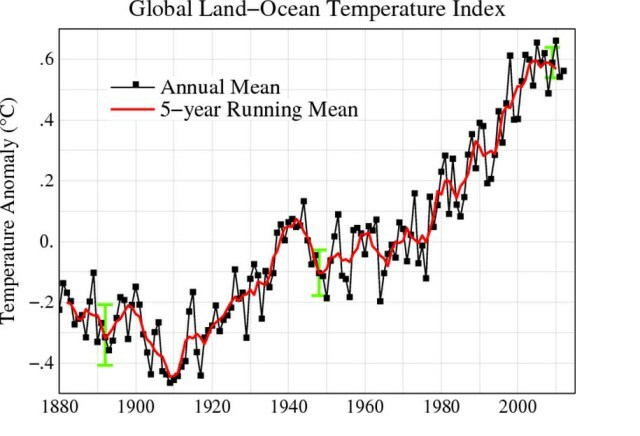 Yet now they show a lot of warming over the same period. Welcome to Orwell’s 1984. The US government is rewriting the past to suit the desires of the White House. 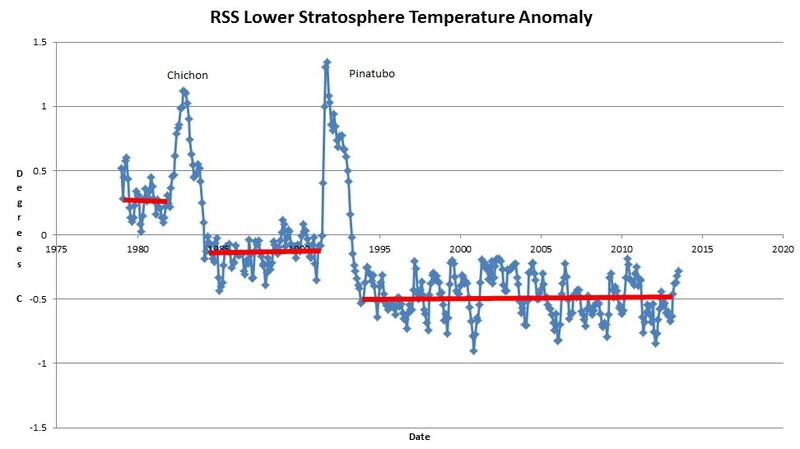 Joe Romm says that the hockey stick represents unprecedented global warming. This is amazing, because the IPCC was completely unaware of this phenomenon in 1990. Apparently the world was heating out of control and the climate was collapsing since the middle of the 19th century, but the IPCC completely missed it. They thought that the world warmed much faster coming out the LIA. How could the world’s top climate scientists have been so ignorant? 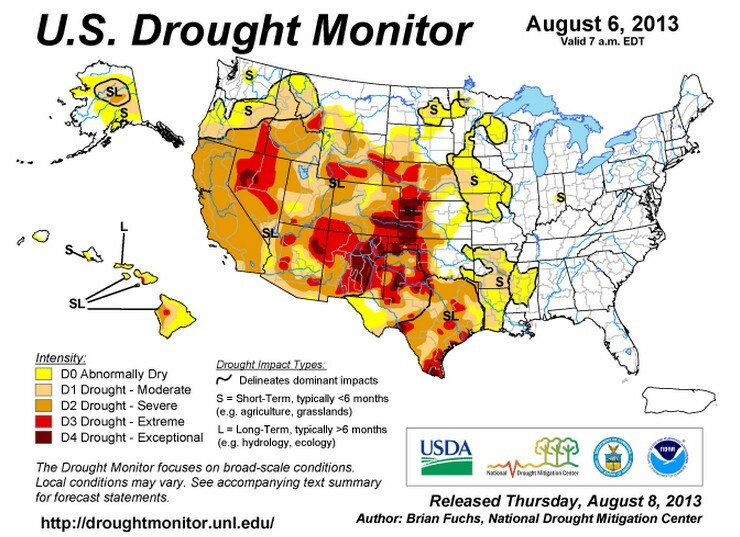 The Washington DC based US Drought Monitor says that the southwest is having an exceptional drought. 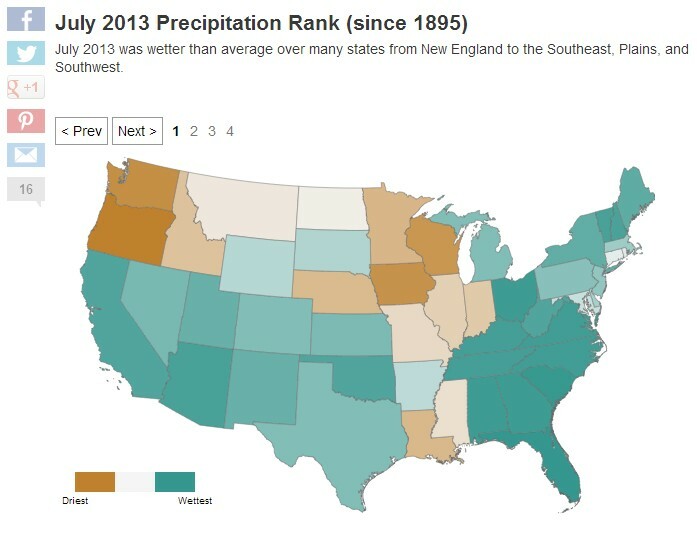 The Weather Channel says that this summer has been one of the wettest on record in the southwest. Joe Romm says that the southwest is having a permanent drought. The graph below shows the difference between the published data and the measured data. 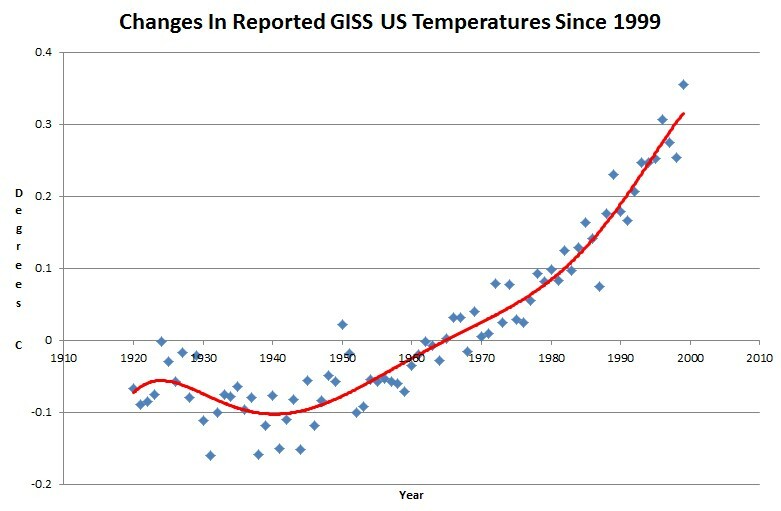 The next blink comparator shows changes in the US temperature record from GISS. It alternates between their 1999 graph and the 2012 version of the same graph. The past is cooled and the present is warmed. 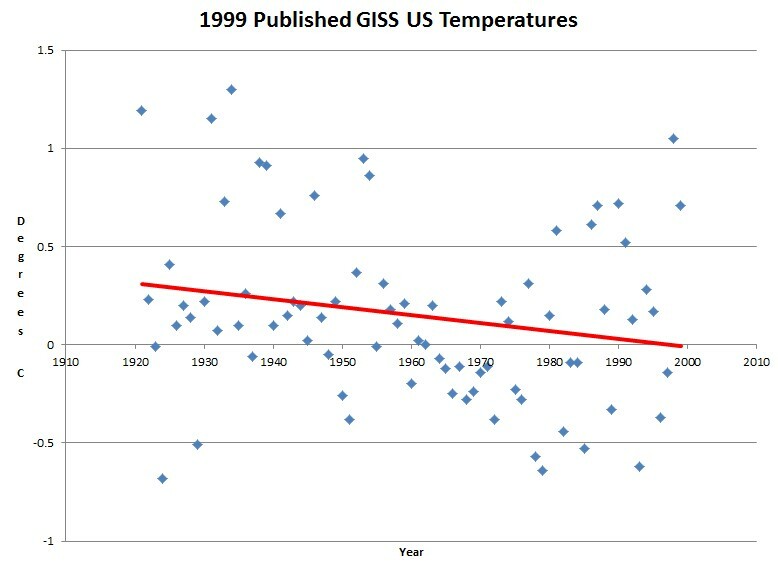 The next graph shows the difference between the 2012 version of the GISS US temperature graph, and 1999 version. People just weren’t smart enough during the 1960s to know how to read a thermometer correctly. Oddly enough, Jimmy and Tommy didn’t recognize the need to tamper with data for many years – until they realized that temperatures were going the wrong direction. 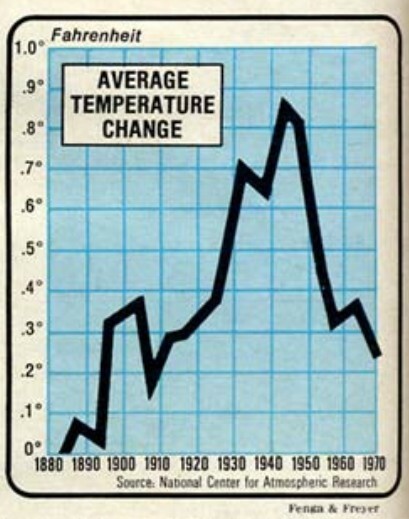 WMO just published this graph, which completely erased the cooling from 1940 to 1970. 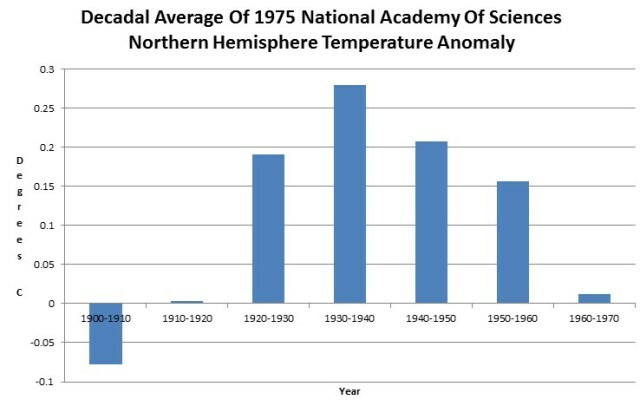 In 1975, the National Academy of Sciences showed more than half a degree cooling in the Northern Hemisphere from 1940 to 1970, and that 1970 was no warmer than 1900. 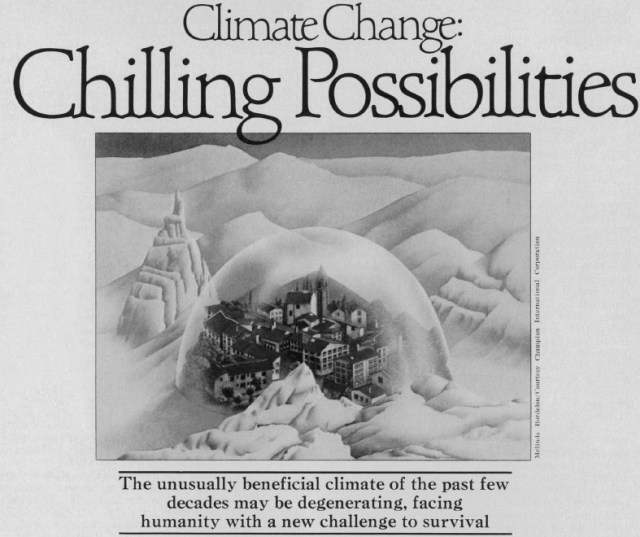 NCAR showed exactly the same thing in 1975. 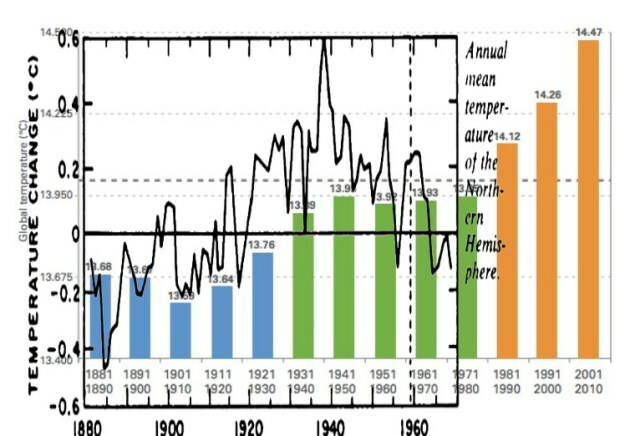 The graph below overlays the 1975 National Academy of Sciences Northern Hemisphere graph on the current WMO Global graph, and shows how the UN has created a 100% political data set, which has no basis in the actual temperatures which were recorded. The Northern Hemisphere data is not going to exactly match the global data, but both are driven by ENSO which means that it is not credible that the two hemispheres could be moving in opposite directions.. The next graph shows the decadal average of the NAS graph, calculated by numerical integration. 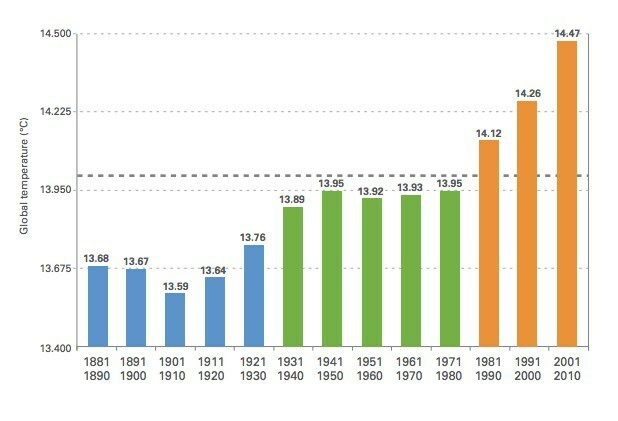 Note that 1930-1940 was 0.25C warmer than 1960-1970, but through the magic of data tampering – WMO made the 1930s colder than the 1960s. 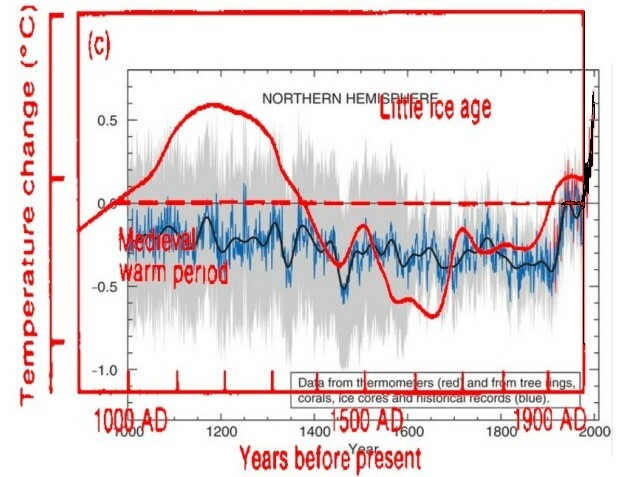 NASA has been hard at work cooling the past and warming the present. 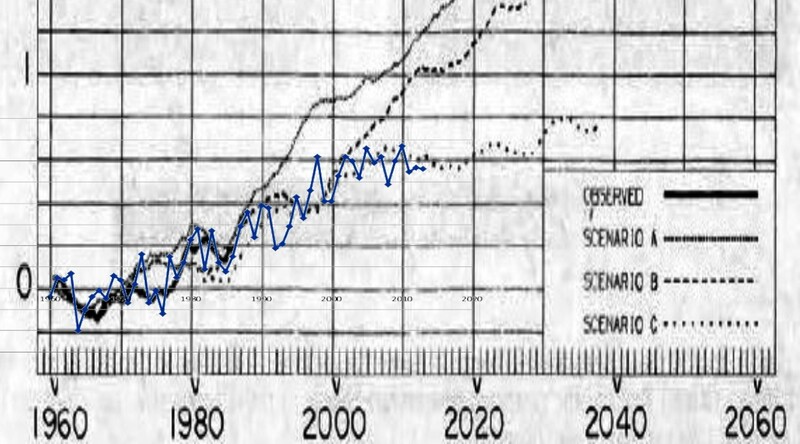 But despite their best data tampering efforts, they still have not been able to get temperatures up to Hansen’s zero emissions in the 21st century Scenario C. Blue line shows the most recent reported GISS temperature.